I am excited today to share my dining room and how I prepare my home for the holidays. Think of what you truly love and how you want your home to look for the holidays. This is as easy as picking a theme. Once you establish your theme the rest should be fun. I celebrate Christmas, so a meaningful Christmas tree is important to me. To make my tree meaningful, I use what I love....nature, family heirlooms and ornaments my daughter made when she was little. Bring in nature and use it in your decor. This is the simplest way to decorate and it is my favorite! Place a few evergreen clippings on a shelf along with pine cones for instant holiday decor! Keep it simple, I'm sure if you're like me you have accumulated a ton of Christmas decorations over the years. Carefully dig through the boxes and use only a few of the items and put the rest back in storage. It's okay really. I finally mastered this and I am guilt free! Buy something new that fits with your theme. This goes back to planning. Define your theme and buy only those items. This will save you money. I like to mix the new items with my family heirloom pieces. Here is how I decorated my woodland theme dining room using the five tips above. This is the very first year I am using a tabletop tree for our only Christmas tree! I decorated our farmhouse style mantel with a woodland theme. We enjoy a leisurely breakfast in front of the fireplace on Christmas morning. My favorite item in the dining room is this stainless steel medical cabinet that I use for storing our everyday dishware and my collection of bottles. I gave the stockings a little makeover using the trim from a Santa's hat. This decoration was fun to put together! I glued pine cones to a faux wreath, added lights and hung a deer cutout on the wreath. Then I hung a simple frame. On the shelves next to the fireplace, I added pops of red to the neutral decor. Here is where I mixed the new items with my vintage ones. For a quick decorating idea, place ribbon inside a bell jar and display vintage light bulbs in a glass vase. Love your holiday tree. Glad to see you add my favorite thing pine cones, in my home, I also add lots of pine cones.They are everywhere in my back yard. You have a lovely home. So nice to meet a fellow pine cone lover! Thank you so much for stopping by! Julie - Your home is so pretty. Your tips are spot-on for creating a beautiful holiday home. So fun hopping with you...Happy Holidays! Thank you so much! It is fun hopping with you too! Glad you stopped by! I love all the rustic touches throughout! Your buffalo check chair is amazing. Enjoy and Merry Christmas! Oh I love those furry stockings!! Happy Holidays! I love your home. 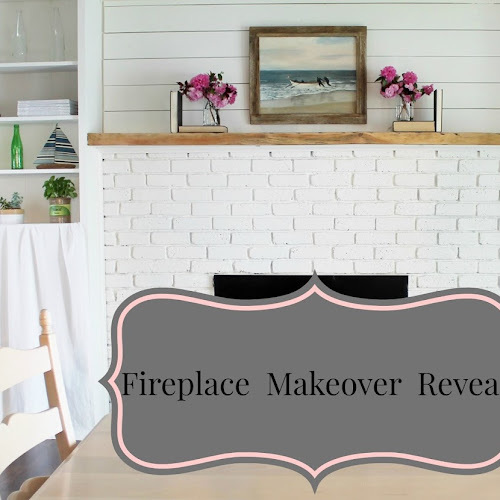 Your fireplace is beautiful and how you added pops of decor to all the little spaces is just perfection. Merry Christmas!! Loved seeing your home on the hop. It all looks so festive! Thanks for sharing. And I love the houndstooth checked chair! Love your dining room. It's gorgeous. And your fireplace mantel is just perfect. Thank you so much for sharing. Merry Christmas. I love all of your great tips! Your mantel is beautiful! Merry Christmas! What a beautiful dining room! I love it, it is gorgeous! Pinning! Love your tips to use nature and make it meaningful - totally agree! Merry Christmas! Your home is so pretty!! Love it!!! I love the spin on the traditional tree! Shared and pinned!! I completely agree about simplifying! Love you Market sign and enjoyed seeing your Christmas decor! love your beautiful home! The stainless medicine cabinet is gorgeous! Merry Christmas! Your home looks really lovely and bright! I totally agree about using fresh greenery! Such a classic look. Having a theme is definitely a great way to decorate for the holidays. It makes it easier knowing what to use from the bins or what to buy. I also love using nature in my decor. Your home is beautiful! I love all of your adorable woodland touches :) All of your greenery just makes me smile. Hope you are having a lovely holiday season. Beautiful! Everything is so warm and inviting! I love your mantel!